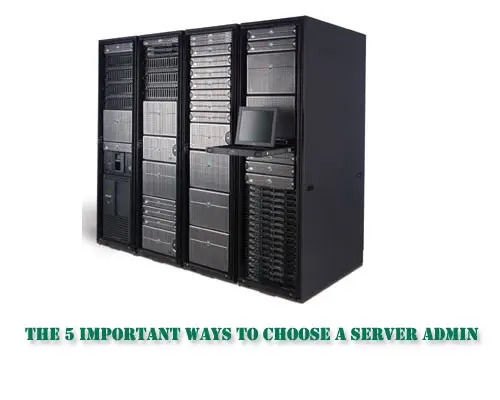 You know the 5 important ways to choose a server admin? Home » Uncategorized » You know the 5 important ways to choose a server admin? Server administration is not an ordinary process; it needs dedication, punctuality and a lot more. Your business may be a small or big, however if you are using a server to manage or run the business you should be very careful about the server management, unless the vulnerabilities in the server may lead to end the business. So in this article we are including some important ways before you look for a customer. The first and the important way to choose the server administrator or a server management team are on looking on the certifications of the group as well as the individuals. There are several certifications available in server management, important among them are Microsoft Certified IT Professional (MCITP) this certificate is given directly by Microsoft to prove that the individual is able to handle the server and other server relate activities, another important one is Oracle Certified Associate this certification also helps you to validate the server admin. So it is important to check certifications before you choose a server administrator. Another important factor while choosing a server admin on checking the dedication, this can be done by looking the client testimonials or from the LinkedIn recommendations in his LinkedIn profile. If you are looking for a group make it mandatory that you look for the website and client testimonials. Obviously there are several other ways to check the dedication, go and check the dedication before you fix a server admin. Next one to consider is check whether they are giving affordable plans or not. This you can measure by getting quotes from some 4 or 5 groups or individuals, but make sure that they had collected the necessary details before they go for the estimation, So that you will get an idea of the cost. Sever administration cost will be different for each business, so go for a thorough check before you select a plan. This comes as must for server administration, and you server need to be monitored 24*7 if not the result will be very worse. Make sure that the admin or the team can monitor the server 24 hours a day and 7 days a week. The main advantage of 24/7 support is your server will not go under any kind of vulnerabilities. Another factor to consider while choosing a server admin is security audits, if they are performing security audits at least twice in a month that’s fine. The quality of the audits is must; these audits should be world class and should consider even the small kind of vulnerabilities that may occur in your server. Don’t think that these 5 are the only ways by which you can finalize a server admin, but these are the important ones to consider. Take some time to validate the profile of the admin or the group of the admins and do a happy business.